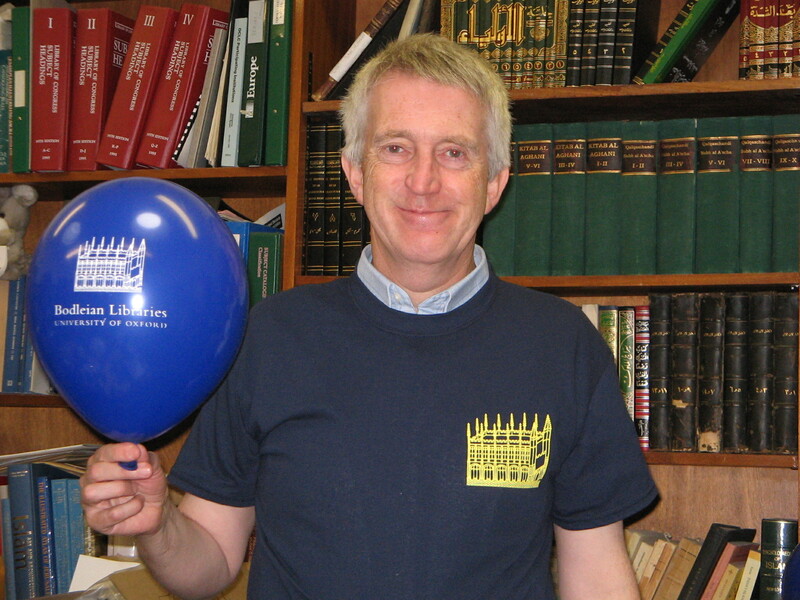 Today we said goodbye to Jonathan Acton, who has worked at the Oriental Institute Library since 2010, when he moved here after the closure of the New Bodleian. Jonathan first started working in the Bodleian Libraries in 2007, in the old Oriental Reading Room, and has spent the past nine years assisting readers of modern Oriental materials. When the reading rooms were re-organised in 2008 he worked in the New Bodleian Reading Room, as well as carrying out book-processing duties behind the scenes, and then moved to OIL along with Kate when the refurbishment started. We wish him the best of luck in his future endeavours, and lots of fun playing with his grandson! We are sorry to see him go; his dedication to helping the readers has made him a valuable asset to the library, which will be a quieter (and probably less tidy) place without him! Despite repeated reminders, we are still finding evidence that readers are ignoring the rule that only water in sealed containers such as bottles may be brought into the library. We have found a number of cups containing coffee dregs over the past few weeks but have unfortunately yet to identify the culprit or culprits. Several readers with cups of water have also been spoken to. We are not doing this to be awkward: the reason we don’t want coffee or other drinks in the library is purely for the protection of the books and equipment. We would politely request that readers respect this rule. We would rather not return to the days when readers were not permitted to take their bags into the library! In happier news, November saw a milestone in the reclassification project: the end of the “D” section! D (History) has taken Kate since February 2014 to reclassify, with much of the collection moving into comparable sections in the Library of Congress sequence, although there were quite a few geography books which ended up in G! The vast majority of former “D” shelfmarks – numbering almost 6000 books – are now in the LC sequence, which moves us a step closer to simplifying our shelving scheme and making it easier to find the books. Since finishing “D”, Kate has also polished of “J” (Political Science) and “M” (Music) and is currently working on the end of “N” (Fine Art), before once again moving the books into the space created over the past few months. This move is likely to start in the next week and will be finished before the start of Term in January. Next on the reclassification project: “P”, but Kate says she’s not going to think about those just yet! A number of periodicals which are currently shelved within the LC sequence are going to be moved into a space near the other periodicals (round the corner past the photocopiers) within the next few weeks. This is partly to free up space and also to rationalise the collection with a view eventually to having all periodicals on the ground floor in the same area. A prefix “Per.” will be added to these items to distinguish them from other materials with similar shelfmarks. Vacation Loans are now in effect! Books borrowed from now on will be due back on January 17th (Tuesday of 1st week). Readers are requested to remember to renew books which were borrowed before this week to avoid a nasty new-year library fine surprise. The library will be closed from 22nd December to January 3rd inclusive. This is a day earlier than the other Bodleian Libraries, which are open on the 22nd but closed on the 23rd onwards. We have already noticed the dwindling numbers as many of our readers are leaving for the holidays and would like to wish everyone the best of the season! This entry was posted in News, Opening Hours, People, Re-organising the Library, Vacations on 2 December 2016 by katieguest.